This Wednesday I am showing you my banner. It was completed just before the weekend. I was very excited to be doing a banner, as I thought no one else had made one. Then to my surprise, Jeannie's creation came up. All I can say is, "Jeannie, great minds think alike" and I hope you like mine just as much as all the fantastic comments you gave Jeannie. I started off with wooden off the page flowers from Kaiser and went about covering them with Sweet Nothings 6 1/2 paper pad also by Kaiser. Starting with the Dainty Dutch Deco Frame, I cut the middle out and used that for the middle of each flower. On top of the flower are bling alphabets with small wings just underneath. The edges of the flowers are covered in pearls. The flowers are made up of the Miniature Rose, the Cuties 2, the Darling Daisies and the Stacker Flower #1 Leaf. Finishing off with ribbon and binding them all together used pink links. 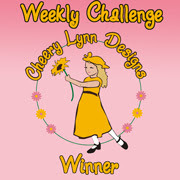 Thanks for stoping by and if you would like to join in the fun at Cheery Lynn Designs, click here to find the latest challenge. Wow! This is so gorgeous. I love the soft romantic colours and the flowers embellish it so well. Really beautiful! I have chosen you to recieve the Liebster Blog Award, as your work is so inspiring. I hope you will accept it. 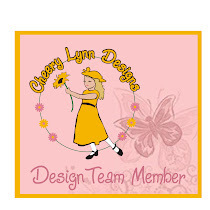 Check my blog http://delightfullycrazytoo.blogspot.com.au/2012/03/liebster-blog-award.html for details. Hello again from 'across the pond! Just beautiful Celeste, your work is awesome and I love visiting!